The local male tour guide (english) for Pompeii is very disappointing. He is totally disinterested in his job. His english is not clear, monotonous tone, lazy and not doing proper Tour of the place. If you see other guides around, it is very clear he is very lousy. Totally not worth the money, and time. He even has the cheek to tell other tour members that he don’t know, and when drilled, just said they are not important. Speechless and left a bad impression..
Guide dans le bus plutôt un accompagnant. Difficile à comprendre, par contre la guide de Naples professionnelle. 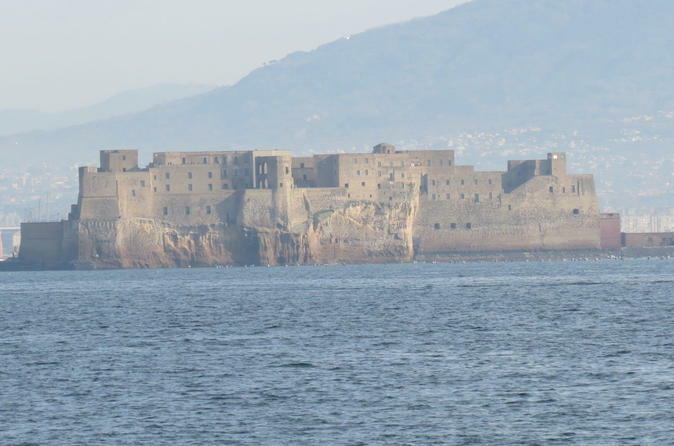 Mais la visite de Naples intramuros sans intérêt, il aurait mieux valu visiter Herculaneum. We had a private transfer to the bus; we didn’t know until after the tour that they do not return you to your hotel. - which was fine as we weren’t far from the tour bus- however, it should have been mentioned!! The tour was well paced and allowed us to see a couple places of Naples and an extensive look at Pompeii! Lunch was exceptionally good! Excellent tour. 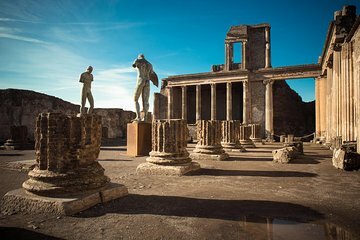 We had wonderful tour guides, although one of them had a very heavy Italian accent and was difficult at time to understand unless you were speaking to him one-to-one.The lunch in Naples was fun and the tour of Pompeii was excellent. Duration of the tour was just right. Provided a good insight about Naples where we had a sumptuous lunch - the dessert was amazing!Our guide was very thorough and patient, making the walk around the ruins of Pompeii interesting and easy. Highly recommended. Naples was just another urban city full of interesting historical landmarks but my real interest was Pompeii. This is a great comfortable air-conditioned bus ride trip. We very much enjoyed this tour and I will highly recommend this tour. This was a fantastic tour if your time is limited but a long day. It was great not to have to drive to Naples and Pompeii but be driven in a luxury coach. There were 6 of us including a 10 year old and 15 year old. Like most places you could always stay a bit longer but we had a taste of Naples and Pompeii but hope to go back one day. We also stopped at a shopping outlet which gave us enough time for a coffee and a cameo factory next to the Pompeii site. Our tour guide in the coach Palo was difficult to understand at times which was a shame as he was trying to give us lots of information. The tour guide who came with us to Naples and Pompeii was very informative but sometimes difficult to hear as the head sets kept cutting out. The closer you were to her the better. The lunch in Naples was OK, I have had better but it must be difficult to cater for such a large number of people. I would recommend this tour. Honestly, Naples was just okay to me. Maybe I need to go back and spend more time there to appreciate it more. However, Pompeii was extraordinary. I was amazed to see how much was preserved in this ancient city. I truly enjoyed not only seeing it but learning about the history. Make sure you drink plenty of water while on this excursion, the heat was insufferable. From being picked up at hotel until drop off at termini central. Day was great. Great guides. Could have done without the outlet mall stop, but had good food there and wasn't too long.